Miss Mona, Shy, Angel and Jewel. Dressing room. Well we did it. 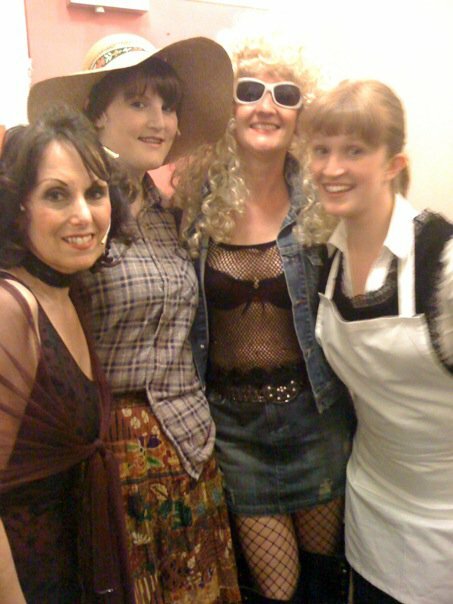 Spalding Amateur Dramatic and Operatic Society performed The Best Little Whorehouse in Texas for the first time last night. A smallish audience for the first night which was probably just as well, seeing as there were still a few technical hitches, such as not being lit for one scene so three of us girls were talking to each other in the semi-darkness. I’ve also got a problem with my head microphone. I tried wearing it under my wig for the first scene, but when Miss Mona (the Madam) takes the wig off my head, the mic comes with it and gets tangled up. Will have to re-think it somehow as my voice is now too quiet and only gets properly projected in the next scene when I can re-do the bloody thing on my own hair! Oh the drama of it all. What was great last night was seeing the excitement of the cast as everything fitted into place. We have a lot of new members this year, for some of them their first time on stage. Their pre-show nerves and post-show exhilaration was palpable. What a band we have too! The stipulation of performing this show is that there must be a live orchestra (no singing to a backing track) and the band must be on-stage rather than in an orchestra pit. Rather novel, and technically a bit of a headache for the set-builders but as you can just make out on the photo below, the band are tucked in between the two sets of stairs. Singing some of the ballads last night to the beautiful strains of the violin was just heavenly. A big congrats to all of our fantastic whores who shook their little tushes last night with such style. We have all shapes, sizes and ages in our whorehouse and why not? There are some ample bosoms jigging about most of the evening – the poor band members sitting in the middle aren’t quite sure where to look! The fun we ladies are having is hopefully infectious. It is certainly liberating. Got home late last night, Hubby and son both in bed, but the former was awake enough to listen to my chit-chat as I sat on the bed eating toast. At midnight I was washing out a selection of itsy-bitsy underwear. By 1am I had just about come down from the high to collapse into bed. This morning, back to being a mum, making breakfast and sorting out school bags. As I hadn’t seen my son Rory much yesterday I took him to school, rather than let him take the bus, so we could have 20 minutes of mum and son time, happily listening to Radio One together as I drove into town. Poor little bugger is coming to see his old tart of a mother in tonight’s show, along with husband and the in-laws. Let’s hope they’re not sucking lemons after seeing their errant daughter-in-law behave in a very un-ladylike manner. Ah well, I’m only acting………..honest! Next Article The Gallery – Self Portrait – Who am I? Where can I buy tickets?! @muummmeeee – haha! Well I can tolerate Chris Moyles in the morning as I like the banter, but sneakily turn the dial later in the day! @Steve – I'm sure you live too far away! Just use your imagination….. Fantastic!! So glad it went well albeit with a couple hiccups, but nothing that can't be handled from the sounds of it. The mother and child time is so very precious isn't it. You go girl! I would never have the confidence to be part of such a thing, but it looks and sounds like you had a great time! When do you go on a national tour?